In addition to unveiling a slew of new hardware on Tuesday, Apple also announced version 3 of iBooks, its reading app for the iPad and iPhone. We’ll have a full review soon, but in the meantime, here are some early impressions from our initial hands-on experience with the app. The most prominent new features are iBooks’s new scrolling theme, newly integrated sharing options, and an Amazon-inspired, iCloud-powered bookshelf. 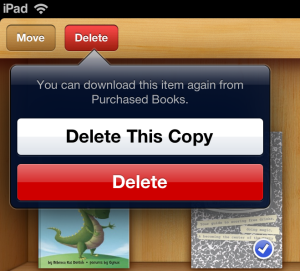 Delete This Copy removes the book from your device, but leaves its icon there (with the cloud download button). Delete removes it from your shelf entirely. Let’s start with that last feature, since the iBooks bookshelf is the first thing that greets you when you launch the app. Previously, it listed the books you’d downloaded to your iOS device. 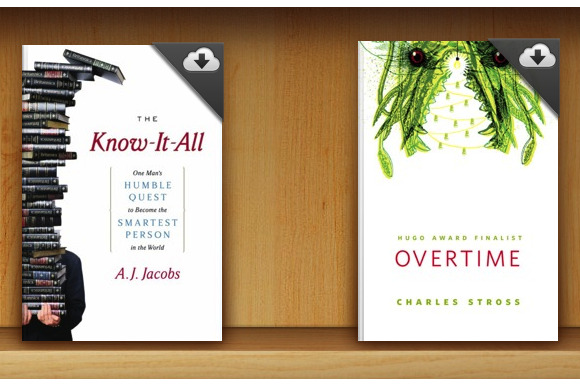 With iBooks 3, you’ll see every book you own listed. Those books that reside only in iCloud sport a tiny cloud download icon on the upper right corners; tap on them, and they’ll download so that you can start reading them. If you want to delete a book from your bookshelf outright, you get that option under the Delete button, too. Once you’ve done that, you can restore that book to your bookshelf only from the Purchased Books tab in the iBookstore. Once you’re reading a book, you can take advantage of the other two prominent new features in iBooks. The first is a new theme called Scroll. That option joins Book (the skeuomorphic theme with which iBooks first launched) and Full Screen (which hides the pseudo-book chrome and lets the text fill up the entirety of your display. Like Full Screen, the Scroll theme is free of any faux-book imagery: You just see your book’s text. But instead of swiping between pages of your ebook, you simply scroll through it vertically—much as you would with text in Safari, Mail, or Instapaper. You still get subtle chapter breaks—visual separators to indicate that you’re moving from one chapter to the next. But page numbers scroll by, instead of being fixed in place; as you scroll through the book, the page 23 marker will appear at the bottom when you get there, and scroll up off the screen as you continue reading. That said, a more permanent page indicator sits fixed at the bottom of the screen, along with iBooks’s still-clever “pages left in this chapter” indicator. Along the right side of the screen sits a vertically-oriented series of dots offering a more visual take on where you are in the book. The Scroll theme puts your book full-screen, without the need to swipe across virtual pages. You just scroll, scroll, scroll. In early testing, however, the Scroll theme suffers from some surprising stutters. Instead of the smooth, buttery scrolling to which iOS users are accustomed, you get frequent hiccups while you scroll. It’s clearly a mode better suited to the iPhone, iPod touch, or new iPad mini; on the full-size iPad, the mode seems a little silly. When you encounter a passage in your book that’s too good not to share, iBooks 3 lets you quote it on Twitter or Facebook, or share it in other ways. First, you use the highlighting option introduced in iBooks previously—where you simply tap and hold at the start of the section you’d like to highlight, and then drag your finger across it. Then you tap on the freshly-highlighted section to expose various options like changing the highlight color, removing it, or adding a note. A new option there is the Sharing button (the boxed arrow); tap it, and you can choose whether to share the citation via Mail, Messages, Twitter, or Facebook, or to copy it to the clipboard. 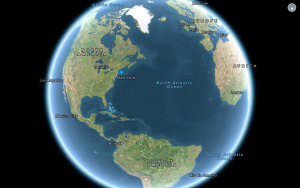 You can share passages from your ebooks via Twitter, Facebook, Messages, or email. iBooks will attempt to include attribution information for the quotation, including the title of the book and its author, along with a notice that the text may be copyrighted. If, however, you’re posting to Twitter, most of that information won’t fit, and it simply gets truncated in the Tweet Sheet. 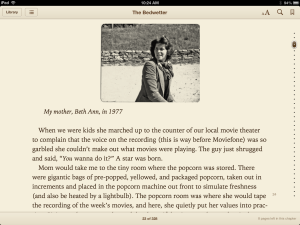 In short, the new iBooks doesn’t seem to be a dramatic change from its previous iteration. Instead, it appears aimed at making the reading app a bit more social, and a bit more usable—whether you’re using a device with less storage, or one with less screen real estate. Look for our full review soon.